In Seven Questions, we interview writers, editors, designers, and others in publishing. 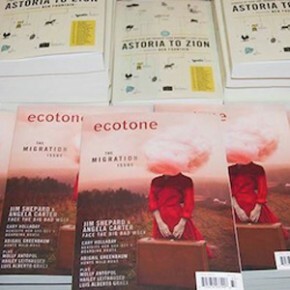 Today we talk to Jamie Poissant, whose essay “The Story of a Year” appears in Ecotone’s tenth anniversary issue. His debut short story collection, The Heaven of Animals, was published by Simon & Schuster in 2014 and is just fantastic. Jamie is also just an all-around great guy and model literary citizen. Seriously. Follow him on Facebook–he’s the best. I read so many things all at once, it’s embarrassing. I just reread Molly Antopol’s The UnAmericans and James Salter’s Last Night, both of which I’m teaching this semester, along with John McNally’s book on writing, Vivid & Continuous. I’m reading several novels, including Magnus Mill’s The Maintenance of Headway and Andrei Codrescu’s The Poetry Lesson, and I keep dipping in and out of a few different story collections, including Shawn Vestal’s Godforsaken Idaho and Danielle Evans’s Before You Suffocate Your Own Fool Self. Next up in my pile are Lauren Groff’s Fates and Furies and Percival Everett’s Half an Inch of Water. My favorite novel of all time is The Great Gatsby. I’ve read it a dozen times. And I understand, toward the end, that Tom and Gatsby have to switch cars for the plot to carry forward. But that moment always feels forced to me, contrived. I wish Fitzgerald had found a better way to handle the car swap. Even as a power play, it seems out of character for Tom to want to drive Gatsby’s car or for Gatsby to let Tom drive it. The only real explanation is that Myrtle has to mistake Gatsby’s car for Tom’s at the end. It’s a plot device that could have been handled more gracefully, in my opinion. Otherwise, the novel—again, in my opinion—is pretty much perfect. My answer to that question changes every week! The best thing about literature right now is that there are so many beautiful debuts every month, and the range of voices is expanding and becoming more inclusive, which is exciting to watch. I have not read it yet, but I have my eye on Claire Vaye Watkins’ first novel, Gold Fame Citrus, which was just published last year. (Her first collection, Battleborn, blew me away.) I’m also looking forward to Shann Ray’s first novel, American Copper, which was published this past November. 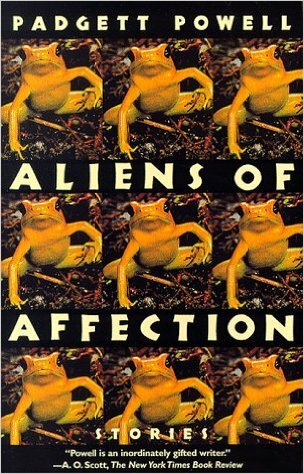 Padgett Powell’s Aliens of Affection. The paperback has a picture of a frog copied nine times, so it makes for a really trippy cover. Paris. Or Iceland. My wife and I spent a week in Paris this summer and, clichéd as it may be to say, we absolutely fell in love with the city. Alternatively, Iceland is a place I’ve never been, but I’m obsessed with the idea of going there someday. The pictures I’ve seen are stunning. The landscape is lush. The architecture is gorgeous. I imagine it would be an inspiring place to live and write. How well do you have to know a place, if at all, to recreate it in writing? Place is essential to my fiction, and all of my settings are presented exactly as I remember them. Once I visit a place, it never leaves me. Even after spending only an hour or two somewhere, I can usually call it up pretty quickly. My wife remains a little freaked out by how my memory works. For example, when we were in Paris, I really grew attached to this one painting at the Musee d’Orsay. A few weeks later, I couldn’t recall the name of the painting or the painter who painted it. But, I could remember the floor and the room where we saw the painting (out of several floors and many, many rooms). So, I went to the museum’s website, navigated the online floorplan, and there it was, the painting, right where I’d left it. I don’t know what this says about me. I wish my spatial memory translated to, like, being better at math or finances, but no such luck. Morning or night? I hope you’re asking about writing. If so, morning. Hardcover or paperback? Both! I love to collect hardbacks, but I also love what publishers are doing these days with paperback originals, especially the high quality ones with French flaps and deckled edges. I’m a sucker for book design. Bookmark or dog-ear? Bookmark, but always an improvised bookmark (index card, sugar packet, toilet paper). I don’t think I’ve owned a real bookmark in my life. Highlight or underline? Underline. With double underlines when something really speaks to me. Novel or short story? Both. Novellas, too! Plus, I actually read a lot of poetry, though I seldom write it. Coffee or tea? Coffee all day long. Dog or cat? A thousand times dog. Sandals or slippers? Sandals, but only at the beach. Say what you will, but I’m definitely a shoes and socks kind of guy. Team Edward or Team Jacob? I don’t know what that means. Okay, of course I know what that means, but I forget which one’s the wolf and which is the vampire. I like wolves, so Team Wolf? Sounds like Teen Wolf. Now there was a movie. 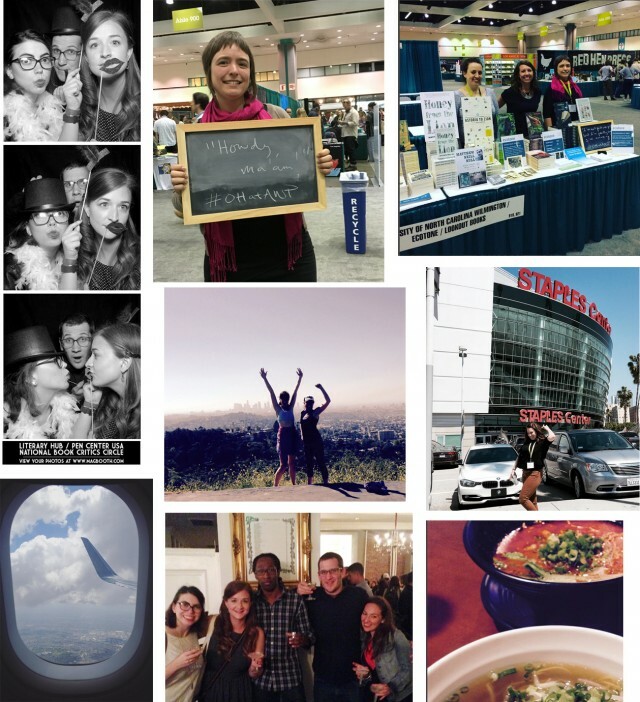 In this week’s Roundup, we’ve got some fantastic contributor news, and a bunch of celebrity photos from AWP. By celebrity, of course, I mean our contributors and editors and students–all celebrities to us! 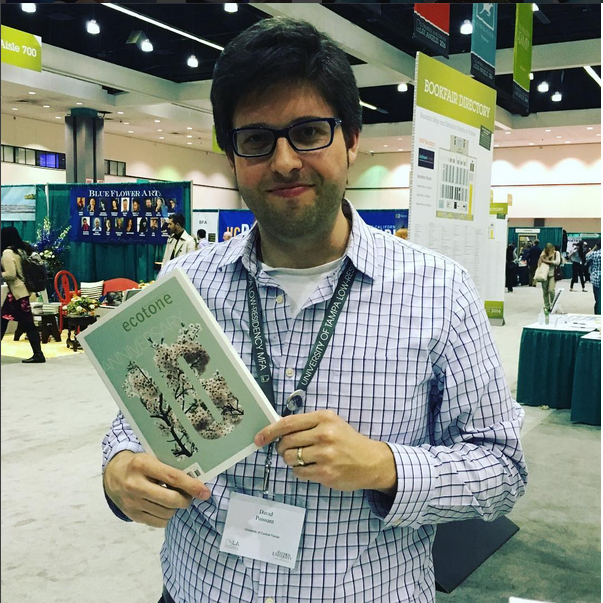 First up is Honey from the Lion author Matthew Neill Null, who won the 2016 Joseph Brodsky Rome Prize, awarded by the American Academy of Arts & Letters. Matt’s getting a fellowship that includes a stipend and a yearlong residency in Rome. Past recipients of the prestigious award include Ralph Ellison, A.R. Ammons, Cormac McCarthy, Anne Sexton, Junot Díaz, Anthony Doerr, Sigrid Nunez, Randall Kenan, and Lorrie Moore, among others–a true celebrity lineup. We’re so happy for Matt! 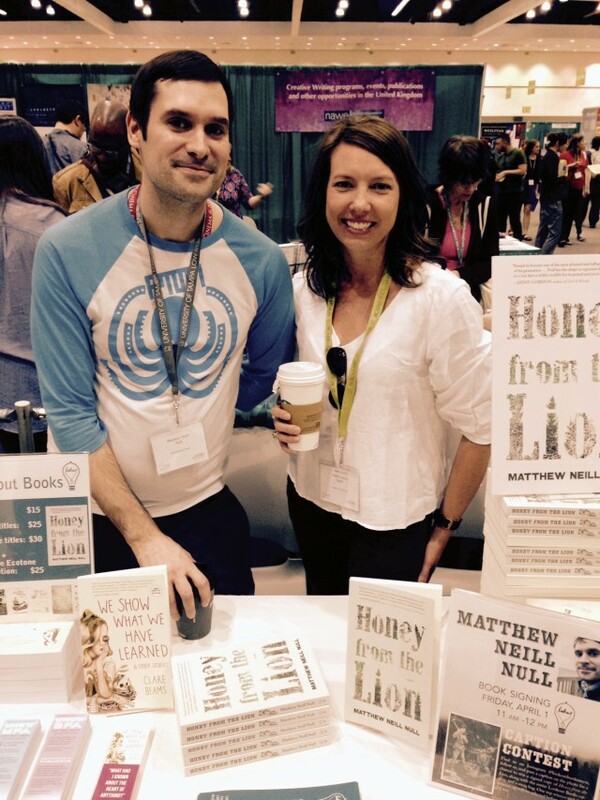 And here’s Matt looking Rome-bound with our publisher and art director, Emily Louise Smith at the AWP booth. You might have heard some buzz from us in the past couple weeks about Lookout’s newest author, Clare Beams. We announced her cover a couple of weeks ago, and if you squint in this picture, you can see the galley there on the table. We’re so excited to share her fantastic collection of short stories, We Show What We Have Learned, with you in October. Before we launch into the full slate of photos, some reading you should check out around the web: Ecotone contributor John Jeremiah Sullivan profiles “Shuffle Along,” one of the first successful all-black musicals, and the painful history of black performance in America. Ecotone contributor Claire Vaye Watkins has an essay up at LitHub about returning to her desert hometown and reflecting on what it means to run away from where you came from. And Lookout author Ben Miller also has an essay up on LitHub about the greatest writers’ group to come out of Davenport, Iowa. Have I mentioned how much we love our contributors and the students who work on our imprints through UNCW’s MFA program? Man, we do. Here are some photos to help share that love. 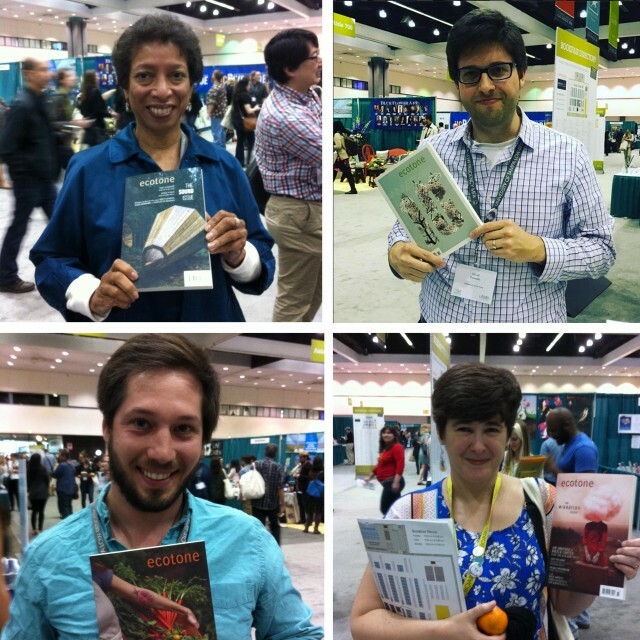 Behold, AWP booth photos from Lynn Thompson, Jamie Poissant, J.P. Grasser, and Leslie Wheeler. And here are our staff: running, goofing, overhearing, eating, and partying (thanks to folks at the PEN Center for the party shots!). We hope your AWP was as filled with inspiration, connection, and celebrity sightings as ours was. We’ll see you next year in DC and back here next week for another Roundup!